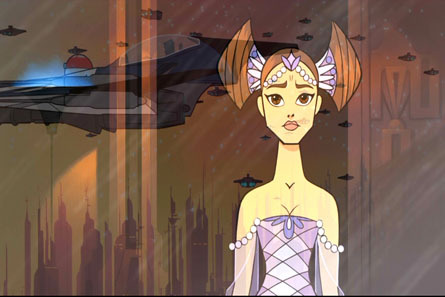 “Like fire across the galaxy, the Clone Wars spread..."
Fans of Star Wars: IV - A New Hope and more recently, Star Wars: Episode II – Attack of the Clones, will of course know about the legendary Clone Wars. 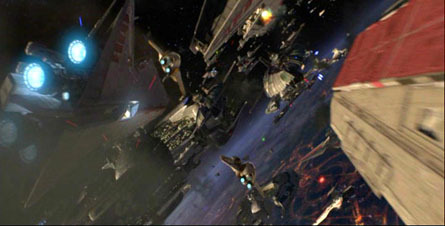 For the first time, fans get to see a glimpse of some of the battles of the Clone Wars in an exciting animated series. The first wave of 20 animated episodes were only a few minutes each when they aired, but thankfully the DVD has been edited into one long episode that runs just over an hour (1 hour 9 minutes to be exact). The last batch of 5 episodes (not on this disc) will be 12 minutes each and they will start to air at the end of March 2005. 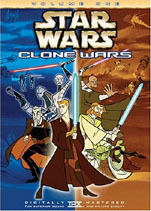 Obi-Wan and Anakin go off to battle – with fighting clones at their side. All the usual characters are there including Yoda, Count Dooku, Palpatine, Mace Windu and Padme. There is even a short introduction to General Grievous, a new enemy in Episode III. Lots of cool fighting. Good music score. Not a big story line. Animated Palpatine looks crazy. 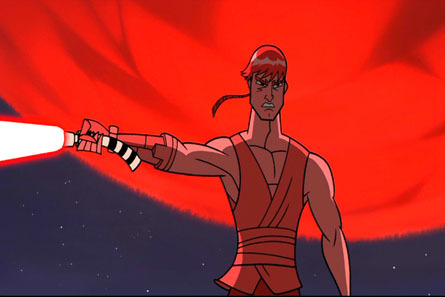 Anakin with a Sith saber. Mace going insane with the Force on some robots. Good stuff. The video on the DVD is presented in 1.78:1 anamorphic widescreen and looks incredible (THX certified of course). The audio for the presentation is presented in Dolby Digital 2.0. You might scratch your head asking yourself why a 5.1 track was not provided. A THX optimizer is included in the options menu. The menus have two distinct random themes: Jedi or Sith. There are two director’s commentary tracks on the disc. 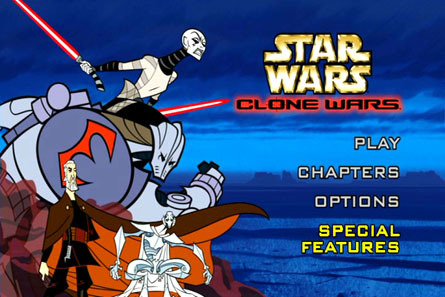 Star Wars fans are going to pick this disc up for more than just the actual episodes of Clone Wars – there are some features you might want to check out. First up is the Star Wars: Episode III teaser trailer (1 minute 47 seconds). Again, where is the Dolby Digital 5.1? The trailer is in Dolby Digital 2.0 and in widescreen. The teaser never looked better! There is a video game trailer (2 minutes 30 seconds) and a X-box playable demo for Star Wars: Republic Commando. Also there is a video game trailer for the upcoming Episode III video game (1 minute 8 seconds). The most exciting extra on the disc is the featurette “Bridging the Saga” (7 minutes 33 seconds) which includes interviews with George Lucas and director Genndy Tartakovsky. 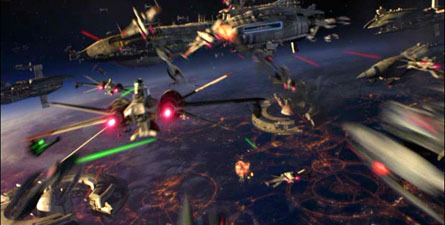 It also includes some short clips of the Space Battle from Episode III. It is going to an insane opening battle. These small screencaps do not do the sequences justice. In the Behind the Scenes section there is a making-of featurette (4 minutes 4 seconds) which includes a look at the people who made the animated series possible. Interesting to see the people doing the voice work. And finally, there is a gallery of rough sketches and posters to flip through. This DVD is excellent and everyone should add it to their Star Wars collection. Volume Two episodes will be airing on the Cartoon Network soon. The last episode of the series is supposed to lead up to the very beginning of Episode III.